Lyon Eats: American desserts - help needed! 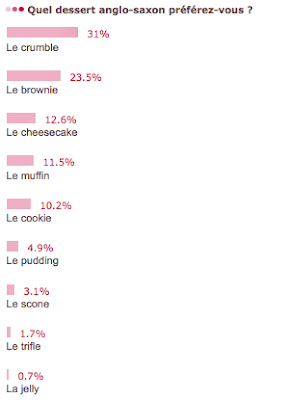 I came across this survey on Le Journal des Femmes recently. 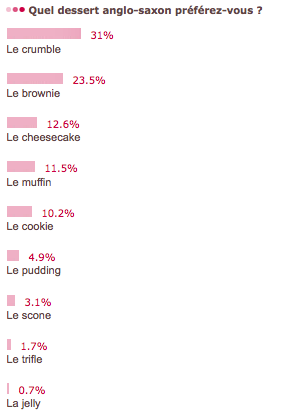 They asked readers (French women predominantly) what their favorite Anglo-Saxon desserts were. Based on the results, I'm pretty sure that in this case favorite should be 'spelt favourite'. Where's the carrot cake, the apple pie, the pumpkin pie or the cupcakes? (And seriously, le muffin and le scone?!) Obviously we Americans have been slacking off on our duty to share the deliciousness of US desserts with our French friends. Summer in France is a great time to get to know your neighbors over apéros or long, lazy dinners. if you want to play it safe on the dessert menu, now you know what people like. If you want to share a slice of American culture, take the plunge and bust out one of those Pampered Chef recipes that are so popular at baby showers and such in the US. I know. Inviting French people over can be intimidating. Which wine(s)? How do I pick the right cheeses? What will be talk about? I'm not much help on those first two questions, but I do have a tip for the last one. Bien-dire has developed a series of audio learning guides for specific situations, including Social Conversations (making small talk), Se présenter (introducing yourself, asking appropriate questions and getting to know people), and Bon Appétit for eating out and preparing meals in France (I've written about this one before - love it). I've negotiated a deal for Lyon Eats readers to get 10% off all orders from Bien-dire (audio learning guides, magazines, cds...). Just enter promo code KMOFF10 at checkout and voilà! How about some good souther Pecan Pie? I'm not in Lyon, but if I was...I'd serve apple crisp...or homemade vanilla ice cream w/ chocolate cake...make that Mounds cake.